Plan your meetings far enough ahead to allow time to gather materials needed. Set goals that you want to accomplish during the year. Outline your program for the year and plan ahead to involve as many people as possible. Plan each meeting ahead of time. You might find it valuable to plan next weeks meeting after just completing a meeting. Always have a plan B, each group will be different and activities that thrilled one den may bore another, and when they get bored they get rowdy. If they are showing signs of boredom drop the activity and go to plan B and you will rarely have discipline problems. If you plan an outdoor activity, always have an indoor alternate planned. Transitions from one activity to the next are easiest if the meeting is planned so that the next activity is always preferred to the current one. For example we begin with opening ceremonies that reinforce the values of Scouting (boring) then go to advancement activities (less boring but not as much fun as games which come next), after games we go to snack time (they are always willing to stop what they are doing for snack!). I use the fact that they have their hands full and their mouths full as the best opportunity for announcements and reminders. Their parents are beginning to show up, and it doesn't hurt that parents are also hearing the announcements and reminders, it also helps to keep those impatient parents from grabbing the Cub and leaving before the closing ceremony, since they intuitively understand that they should not take their child away during announcements. Don't try to carry all the load yourself. In Tiger, Wolf and Bear dens the family unit is central to the forming of the Cub Scout and activities revolved around the family unit. Get other parents involved. Help them realize it is their program and then depend on them to lend expertise on aspects of the program. Invite them to attend by determining their interests and using them. Leadership is developed and learned. You can become an effective Cub Scout Leader if you will prepare yourself and take the time to learn. Remember to be flexible in your planning. There are no set answers to handling boys. Don't be afraid to experiment. Get trained! Start out with the Cub Scout Den Leader Fast Start video. It is very short and enjoyable to watch. After you get settled in, attend the Cub Scout Den Leader Basic Training at your District. It is the best place to go to learn your Cub Scouting fundamentals. Understand the Cub Scout program so you can help the boys grow throughout the program. There is a lot of resources available to help you. One of your best resources is the monthly district Cub Leader Roundtable, where you can exchange ideas with other Cub Scout Leaders. Do your best, and, above all, have fun! Thanks to Susan Ganther for her assistance in developing these tips. 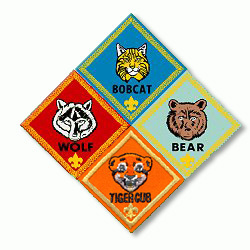 Cub Scout Leader Training is number 34700, Copyright 1994, with the 1997 Update. It contains the Fast Start, Cub Scout Leader Basic, Webelos Outdoor, and Den Leader Coach courses. The videotape you need is number AV-01V008. Supplemental Training for Cub Scout Leaders, number 34703, Copyright 1995, contains the Quarterly Leadership Updates and Unit Leadership Enhancements. Spotlight book, number 13-604, is an annual publication containing relevant special training outlines.